Coriander leaves- Coriander plant scientific name is Coriandrum Sativum L. Coriander, also known as Cilantro, Dhaniya, culantrillo and Chinese parsley, it is an herb in the family of Apiaceae. All parts of plant are useful but Coriander leaves and seeds are most commonly used around the world. Coriander leaves are used for garnishing, making chutneys or in parathas and coriander seed are commonly used as spice. Coriander leaves are delicate lacy leaves, dark green in colour with a smell that is pungent. Coriander seeds are yellowish brown in colour, round to oval in shape and the seeds have aromatic, sweet and citrus flavor. Coriander is packed with potential health benefits and it is wonderful source for vitamins, minerals and other antioxidants. Complete list of nutritional facts and health benefits is given below. 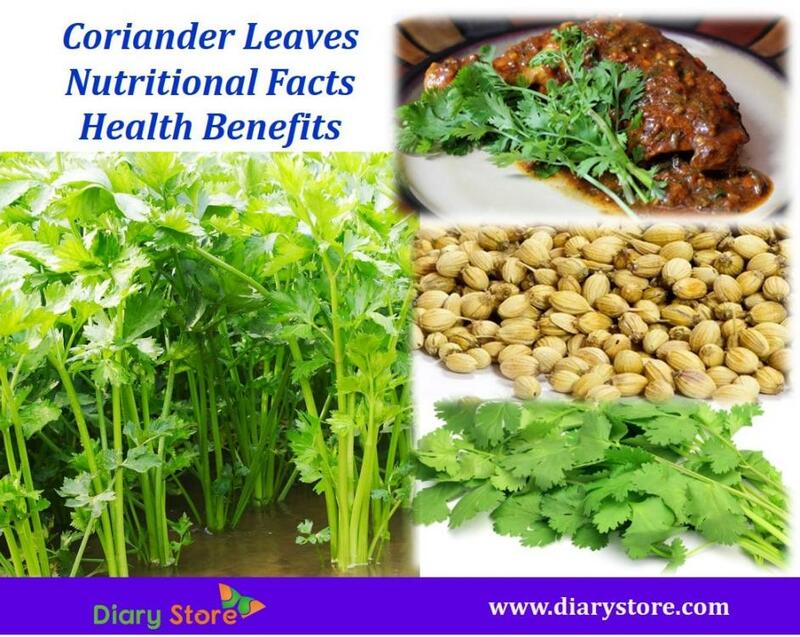 Coriander leaves are packed with good amount of vitamin, Minerals, carbohydrates, proteins, antioxidants. Here below listed the nutrition value per 100 grams (3.5 Oz), percentage of RDA (Recommended Dietary Allowance). Coriander contains good amount of antioxidants, vitamins and dietary fiber and essential oils which helps to reduce bad cholesterol and increase the good cholesterol levels. Bad cholesterol levels can lead to serious cardiovascular issues like artherosclerosis, heart attacks, and strokes. Due to good amount of Potassium, magnesium, calcium, manganese and less amount of sodium present in the coriander reduce hypertension by controlling the blood pressure and also reduce the chances of cardiovascular conditions like heart attacks and strokes. Coriander is rich in Vitamin K; it is good for the treatment of Alzheimer's disease. Coriander contains good amount of anti-inflammatory properties which prevent the inflammatory diseases such as arthritis. Coriander contains excellent antiseptic components, which helps to cure mouth ulcer and wounds. Good amount of iron present in coriander helps to cure the anemia. Iron also helps in increase the energy and strength, and promotes the health of bones. Coriander seeds contains good amount of linoleic acid, ascorbic acid, steric acid and palmitic acid, which helps to regulate proper menstrual cycles and also reduces the pain during the women’s period. Coriander is packed with antioxidants, vitamin A, vitamin C, phosphorous, beta-carotene and essential oils, which prevents eye diseases such as macular degeneration vision disorders. Coriander is very good for digestive system. Coriander produces more digestive enzyme, which helps to settle an upset stomach and prevent flatulence. 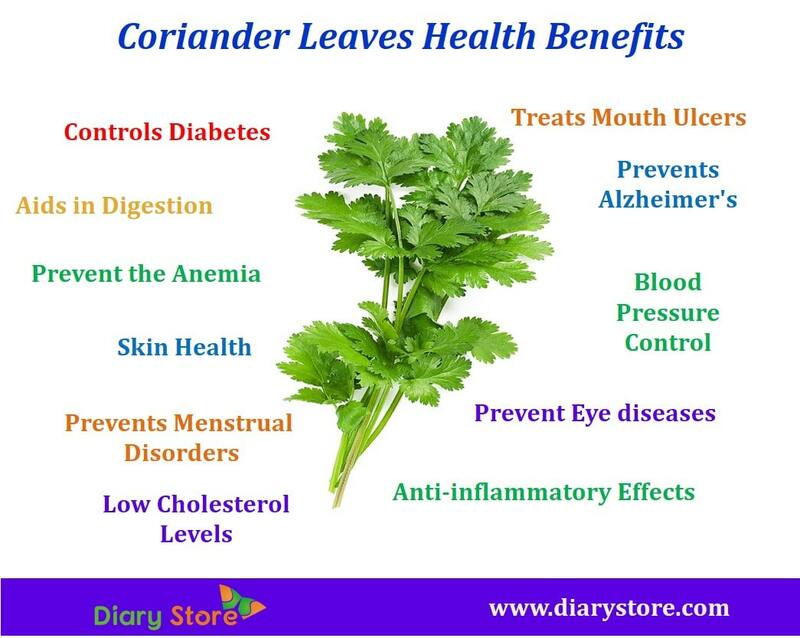 Regular consuming of coriander is good for diabetic patients. It can stimulate the insulin secretion and lower the blood sugar levels. Because of its antioxidant properties coriander is good for clearing up skin disorders such as eczema, dryness and fungal infections.